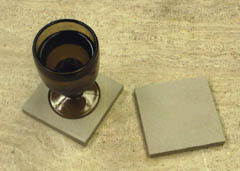 Beverage coaster gift sets are a way to make an intimate statement, without overstepping professional boundaries. Attractive, functional, and appropriate for almost any coleague or acquaintance these sets are sure to fullfill any of your gift giving needs. Beautiful waves of rolling amber mixed with copper tones trailing gently along the surface of these exquisite glass coasters. 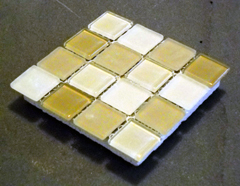 Designed with channel gaps and a naturally absorbent sandstone base, making these the very first, completely absorbent glass mosaic coasters ever created. The perfect upscale gift for friends and family. Available in sets of 4. Hazy gray streaks are broken by flashes of white and gold, which rip across two dozens skies, creating a unique masterpiece in each tiny chip found on the surface of these elegant beverage coasters. 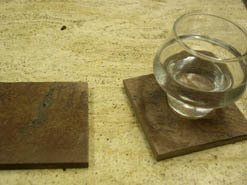 Completely absorbent, moisture will soak down into the sandstone base, remaining within the coasters mountain born material until it can be evaporated away. The perfect gift for any upscale occassion. Varying shades of gold and yellow emerge, contrasted with white and off white chips, to create a struggle of hues, a dynamic tension of tones that gives energy and vigor to the countenance of these exquisite beverage coaster sets. Sold in collections of 4, each chip found in every coaster is slightly different, and the overall pattern is also randomly assorted, ensuring that the set you receive and the set you give will each be entirely one of a kind. 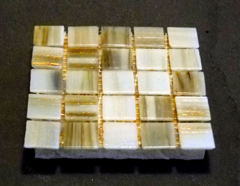 Golden honey comb tones alight upon the surface of these sleek and polished mosaic glass coasters, mixed with varying hues of white and off white, caressed by the light of a sunny countenance, that gives the overall surface of these pieces a favorable and amicable demeanor, uplifting the spirit and adding energy to the subtle nuances of the space in which they are placed. A wild assortment of mixed and matched colors, disparate tones, and multi colored hues, contrast and contend across the surface of these beverage coasters, creating energy and excitement that makes the surface of these pieces almost come alive in a dance of merry moving tones. Brilliant streaks of multicolored hue brush across the surface of these attractivly polished marble coasters, creating unique patterns of contrast and hue which almost seem to be at war with one another, rushing in great waves, and then swirling in eddies, rippling with fascinating tones that delight the eye with each viewing. A totally unique gift for someone special in your life. 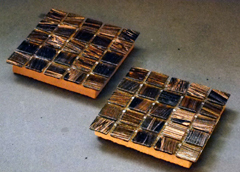 Swept across the surface of these elegant coasters is a thrilling tale of the struggle of life itself. Thats because captrured under the polished surface of the stone, you can see the real dendritic fossilized remains of ancient creatures, plants, and microorganisms, that roamed the earth millions of years ago. 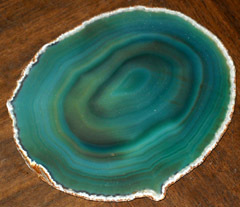 Own a unique piece of the earths geographical history, or make it a present to a cherished friend or co-worker. A subdued backdrop of creamy tan tones is laced with whisps of deep brown, like the trailing fingers of smoke tendrils, slipping gently across the polished surface of the stone, breaking sweet perfection with chaotic interest, claiming the facade of each piece as work of natural beauty, art from the earth itself. Soft whisps of fluffy white cotton clouds float lazily in the air, broken only by the faint hints of storm cloud, thundering subtly beneath a milky white cream. These subtle hints light up the surface of the marble with contrast and energy, providing a subtle vigor that explodes like thunder on a quiet day, light a storm rolling across a face of polsihed perfection. Crimson tones in their passionate pose lie simmering just beneath the perfect polished surface of these coasters. Their steamy heat rising, straining, pushing against its own stony limitrations, until a burst of lightning rips forth, shot from the imbalance of power, the build up of energy, cause by the capture of so intense a tone. 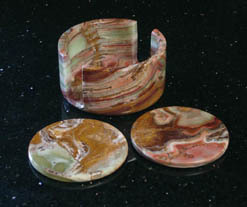 A luminescent green rises from the shadowy depths of these semi translucent natural gemstone coasters. The green pendant orb contains powerful waves of tone and color, which merge and form through one another like glowing shadows fading into misty incomprehension. When giving a gift you want something that will stand out, and be a presence in the recipients life. The great thing about these coasters is that they are so unqiue and exotic, that they instantly make their presence known within a space,e nsuring that this gift will be remembered for years to come. 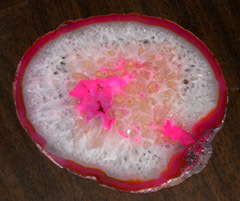 Delightful pink tones rise and fall in cresting rings, which move dimensionally through the semi translucent surface of these gorgeouse gemstone coasters. 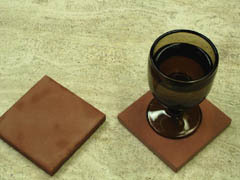 Bundled together in a convenient gift set, they come with a total of 4 coasters. This coaster is a testament to the beauty of artistic inspiration mixing with natural wonder. Here we see intricate carvings, chisselled deep into a natural rock face. exquisite designs and patterns all worked into earth itself. This vision is then captured in graphical form, and imprinted onto the surface of a series of absorbent, natural, mountain born sandstone coasters, resulting in a union which is both powerful and functional. 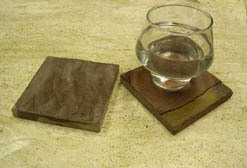 Old World Passages is a set of 4 natural sandstone coasters. 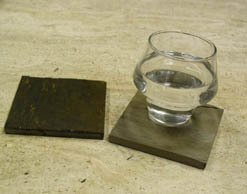 The sandstone is an absorbent material, that soaks the moisture directly from a glass, sinking it into the pores and holding it until it evaporates away. 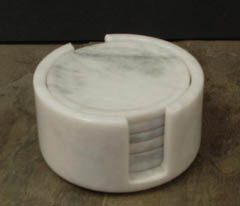 The stone is actually an american quarried material, and naturally it has the color of a beach, or a rolling dessert. However due to advanced printing technology we are now able to print beautifully vivid images directly onto the face of these coasters. The surface of these sandstone coasters consists of a variety of waves of hue, washing over its face like a multicolored earth tone ocean. One of the draws of this particular gift set is that as beautiful and vivid as the colors found in the face of the stone are, they are all natural, and have not been changed or enhanced by human beings in any way. Subtle tan tones wash over the face of the stone, broken by veins of black and brown, which swoop in unexpectedly, shattering the hazy perfection of the stone. And yet in breaking this perfect dessert landscape, the dark tones amke the material come alive, invigorating it with an energy and vibrancy that is far greater than its hues bellie. Gentle hazy tones wash lazily across the surface of this coaster. Yet subtle hues arise from this haze, peaking out in subdued fury, seeking to make known their existence to a world of movement and action. These coasters come in a set of four, and they make a lovely and functional gift for coorporate events, or even for holidays and birthdays. A subdued backdrop broken by a million points of contrasting hue. Soft and subtle, yet powerful, with an energy born from the towering mountain ranges where it was quarried. 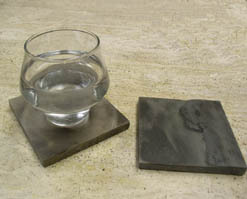 Functionally superb, these coasters represent the true union of nature and human ingenuity, in an environmentally friendly form. When you look at the vivid image of this cute little tree frog, sitting upon a leaf, orange eyes wide open and peering into the undergrowth, it is hard to tell that this image is actually printed on a piece of stone. And yet as you peer closer you start to realize that the hazy tones of shifting hue, the soft impressions of light and shadow, are all enhanced by this natural stone backdrop, and the subtle quality it lends to the whole. Cats everywhere, their adorable fuzzy faces staring out at you, wise and clever feline eyes like slits, open to observe your every move. Should they pounce? Should the sleep? Maybe they dont even care. Its a cats world, and we are only living in it. 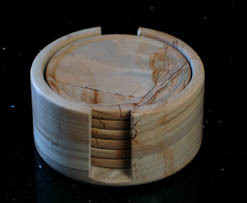 Mkight as well show that off with these attractive cats cats cats sandstone gift coasters. The sandy, beachy nature of natural sandstone, makes this material the perfect canvas for a peaceful beach scene day. here we see a variety of shells, star fish, and conch, all laying out on the sand, taking in the sun. The realism of this scene is increased by the nature of the material, which almost serves to create a 3d effect within this image. 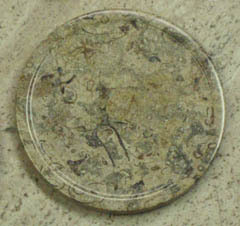 A hazy image, set in brown and white two tone relief. And yet the details of the palm, the hazy background of the piece, the overall style and charm of the various elements in this picture, all serve to create a unique stylized scene, which calls to mind a wealth of stories, mysteries, and hidden secrets, all of which will be resolved some day, from behind the beauty of the stone itself. Primitive patterns, ancient symbols, they swirl and form in the surface of these coasters, giving the entire image a primal feel, like something carved by hand into the wall of a cave, or painted from the most rudimentary berries by a mad desperate primitve artist, yearning to understand the fire that exists as creativity in their soul. A simple image, a plant, resting in a pot, its palmy leaves stretching out in every direction. This is an image that would look as familiar to someone living in ancient Greece as it does to us today. And yet the simple beauty, the erratic symettry, the joyous celebration of life itself is still recognized and appreciated even by our own modern perceptions. An ancient symbol of bravery, chivalry, and honor. The Fleur De Lis is a powerful image, that stirs up centuries of intense loyalty, and brutality, greatness, and horor. Within a symbol such as this you can see many identities, all striving to claim the rights to the positive benefits of such a pictures demeanor. Powerful contrasting tones have been arranged to simulate the softly flowing beauty of natural gemstone. These semi translucent crystals form deep below the earth, and attain a bevy of wild and erratic shapes, which form and reform over millions of years. here we see but an artists rendition of this spectacylar natural event, and yet within his vision we can discern the respect he has for the nature of the stones themselves. An ancient relief up close, allowing us to see only a portion of the great carving, only a piece of the puzzle, leaving the rest for discerning minds to contemplate and toy with until one day, the great mastermind figures out the clues, and unravels the mysteries, of the relic. 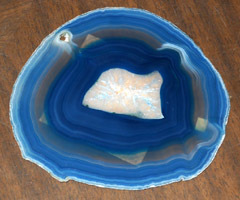 All of this is avaialable as merely the surface of a set of four, naturally absorbent beverage coasters, piece which can play a prominent role in the home if set out properly. Bursting clouds of teeming hue erupt like furious fires seeking to overwhelm the stoic surface of these solid sandstone coasters. Black smoke wafts on ever rising clouds of heat, that are born aloft, only to be replaced by even more luminous bursts, one upon the other, until a caucophony of color is teeming in the surface of these pieces. 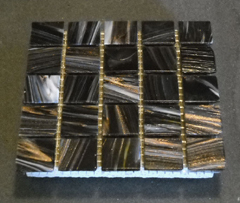 powerful and dominating, an exotic piece of home decor, and the perfect corporate or executive gift set. The surface of these powerful sandstone drink coasters is dotted with the real, fossilized images, of ancient creatures that walked the earth millions of years ago. An instant conversation piece, these coasters are snapshots of the world the way it once was. Panther sandstone is a softly graded stone, with gentle hues washing luxuriously across its sandstone surface, like a multicolored dessert trapped forever in a single gust of wind, suspended and yet vibrant, almost living, with unique features appearing randomly in each and every one of a kind piece. The rainbow stone beverage coasters are by far our most popular set. Available in 4's, 6's, 8's, or as single collectible pieces that can be mixed and matched, you are certain to find the perfect arrangement for all of your most challenging gift giving needs. Highly absorbent and naturally functional, to protect surfaces from moisture stains. Gentle red tones of solid sandstone swirl in subtle patterns, creating clouds of gently graded contrast which playufully alight upon one another. 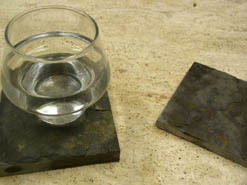 However when a moist glass is set upon the stone, watch the material come alive, as the liquid darkens the ruby to a deep crimson, holding it within its surface, until it can evaporate away, leaving no trace behind. 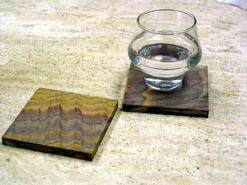 The softest and most subdued tones of the dessert await in the surface of these exotic indian sandstone coasters. Gently suspended sandstone, awaiting with parched lips to drink the moisture from your glass, holding it in safely until it can evaporate away into nothing. Copper slate is a powerful stone, with a surface of deep tones conflicted with one another in mighty movements. All of this reflects the stark and stoic nature of its birth, formed over millions of years deep beneath the surface of the earth. 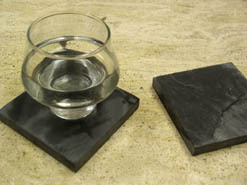 Powerful, almost daunting, copper natural slate beverage coasters are a gift that will make a real impression. Soft earthen tones, almost silky in their sensuality, slip across the surface of the beverage coasters. These gentle whispers of earths great past are broken in time, by lines of red and orange, subtle hunts of sunset that alight gently upon its surface, giving each piece a unique expression which is difficult to explain in anything but pictures and sight. A thousand subtle shades of nature collide in an autumn mist, to create a softly subtle, yet richy complex surface for these unique ebeverage coasters. These colors, and even the gently graded texture, is one of a kind in each and every square, making ever set of four, six, or eight, a completely individual expression, that can not be duplicated or replicated by anyone else in the entire world. Mountain black is a dark and brooding slate. its many midnight shades rest uneasily upon its surface. And yet in this tension of charcoal and black, cloud and grey, you can find an intense sort of beauty, an energy and power that is more than just contrasting colors, it is the essence of its mountainous home, the intensity of the earth itself, embedded in these innocuous drink accessories. 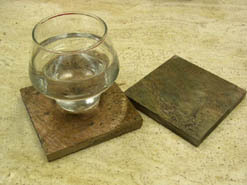 Multi Africa beverage coasters are some of the most intense accessories that we sell. A brilliant explosion of golden light and amber hues is set against a midnight backdrop. The result is a piece which has all of the fury and tension of a blazing inferno alight against a midnight sky. These powerful tones wash over the stone, and yet are fueled by the inherent power of the material itself, which gives the surface of each and every piece a unique symphony of light and tone that cannot be found anywhere else. Multi china is a rebellious stone. 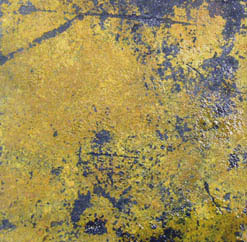 Not content to merely flow with the natural colors of the earth, instead its eeks to burst out, with wild and erratic tones appearing and reappearing in unique visions across the surface of the piece. This powerful colorful surface is made functional by the tiny poires in the stone, which gives these coasters a medium level of absorbency. 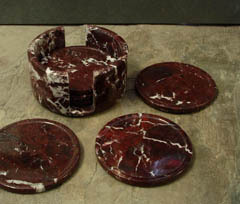 Powerful crimson reds mix with the feint light of amber dawn, all merged within the stoically standing surface of these attractive natural stone drink coasters. The perfect gift for friends, family, or anyone who cares about protecting their posessions. Available in sets of four, six, or eight coasters, these attractive pieces are a great way to connect an environment back with the natural world.